Be Mrs. Wilkes' next door neighbor! Few places have the beguiling warmth and enduring mystique of Savannah GA. Charming public squares, bustling one-of-a-kind shops and historic Savannah rentals make this city a popular vacation destination. To make the most of your Savannah GA vacations, make sure to choose your lodging wisely. Jones Street Retreat is located in the heart of the historic district right off what was once dubbed as one of the prettiest streets in America. It is a brick-paved street lined with graceful live oak and magnolia trees and well-preserved mansions. Jones Street Retreat is a vacation rental Savannah visitors will be happy to find. This one bedroom/one bathroom apartment reflects the spirit of the era with exposed brick walls in the interiors set off by wood flooring and antique décor. This elegantly decorated historic Savannah rental comes with a modern kitchen equipped with the supplies and equipment needed to whip up gourmet meals for yourself and your guests. It has a full-size oven and dishwasher, giving guests a sense of being in their own homes. The spacious single bedroom is nicely appointed with a king-sized bed that comes with all the necessary linens, beddings and some accessories. The room’s design is well thought with wall sconces to provide the mood light you need and still be within easy reach to operate. Unpack your clothes into the closets and dressers, and start feeling that you have really transitioned into the vacation zone. The single bathroom is full-sized with a shower and modern tub. There are a washer and dryer in the unit for your convenience. 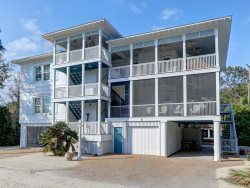 This vacation rental Savannah visitors have been raving about also includes a bonus sitting room in the back with comfortable couches, a flat-screen TV and cable service, so you can keep up with your favorite shows. To top it off, this historic Savannah rental has a private garden with lush landscaping and a café table for four, which is just perfect for enjoying the afternoon breezes. The apartment comes with Wi-Fi access and basic supplies to get Savannah GA vacations started smoothly. Jones Street is an east-west route through the downtown area. It is about nine city-blocks long, yet it does not intersect with any of the famous public squares. Instead, it is an architectural showcase of historic homes and converted townhouses. Most of the shops in this area are part of the Downtown Design District. Walk the promenade and browse antique shops, art galleries and high-end stores where you are most likely to find something made by a local artisan or something rare or both. Fine dining options abound. Some of the popular options that are within walking distance to Jones Street Retreat include Mrs. Wilkes Dining Room on Clary’s Café on opposite ends of Jones Street. The sprawling Forsyth Park is within walking distance while the Mercer-Williams House Museum is on the southwest end of Monterey Square. Check out the Savannah College of Art and Design on Bull Street for eclectic exhibits. Jones Street Retreat is a retreat in the truest sense of the word and one that will keep you coming back to Savannah. Friendly and eager to help. This property was absolutely perfect. We had everything we needed from a comfy bed to a beautiful Secret Garden courtyard. Walking out the front door onto beautiful Jones Street was an experience every time we left the house! Lots of neighborhood bars and restaurants within a short walking distance from the property. If you want the full touristy experience, the waterfront is just a few blocks away. Residents of Savannah are very open and friendly and quick to recommend things. Property had all of the amenities you could want! This was our first visit to Savannah and we will definitely return! As always, Sothern Belle service was top-notch!! Such a relaxing, comfortable, & enjoyable property! Great location on beautiful Jones Street where we could walk everywhere. It was so quiet & serene. We loved the courtyard and enjoyed many mornings & evenings relaxing out there. The two gals in the office were friendly and efficient. Had a brief pleasant exchange and we were on our way with keys in hand. Super easy. Superb location!! Ground floor. Great easy parking spot. If you want a quiet well located place in the heart of the historic core, this is the place. Every time you step out the front door, you know you have a beautiful pleasant walk in your future. I would recommend without hesitation! Our vacation rental at the Jones Street Retreat was seamless. Everything ran very smoothly and without stress. The Jones Street Retreat is the perfect getaway for couples. Quiet and serene. Lovely decor. Centrally located to everything in Savannah. I would highly recommend to family and friends. Little interaction, but sufficient! Nice clear instructions! Great stay and beautiful property. Only complaints are that the shower liner was really dirty and needed replacing, and a\c rattled and made a lot of noise. The team was very accommodating and easy to contact. They were incredibly friendly and helpful. Check in and out was much easier than at a hotel. This was a beautiful, central location. It was well-maintained and clean. They were very kind and knowledgable about the city. We enjoyed the privacy of our apartment. It was nice to stay in a home rather than a hotel. It made us feel like we were locals! The location! Jones street is close enough to walk to everything, but far enough for it to be peaceful. The apartment was very charming, and the location was perfect. Absolutely perfect for the two of us. Very comfortable and clean.